NW Raleigh was set-aside as a bike street by the City of Portland in 1999. Today it’s a neighborhood greenway in name only that has exceedingly high auto volumes and none of the safety features common in other parts of the city. When it comes to the state of neighborhood greenways in northwest Portland, there’s good news and there’s bad news. The bad news is that they’re nearly two decades old, in need of major upgrades, and are smack-dab in the middle of an auto-dominated and change-resistant part of town. The good news is that advocacy to change this dynamic is heating up, the City of Portland has acknowledged the problem, and they’re finally working to remedy the situation. There are six neighborhood greenways in northwest listed on the city’s official map: 24th, Johnson, Flanders, Overton, Marshall and Raleigh. Five of those were established in the late 1990s long before the idea of “neighborhood greenway” was even a twinkle in the eye of city planners. And NW Marshall became a bike street only in 2012 as part of a swap when the streetcar kicked the bike lane off of Lovejoy. NW Marshall west of I-405. Along with a lack of the typical features that make neighborhood greenways work in other parts of town like speed bumps, 20 mph speed limits, stop sign priority for bike riders, diverters, and crossing treatments, the problem with these streets is that they simply have too many people driving on them. National guidelines for bicycle boulevards (another name for neighborhood greenways) say they should have 1,500 cars per day or less. 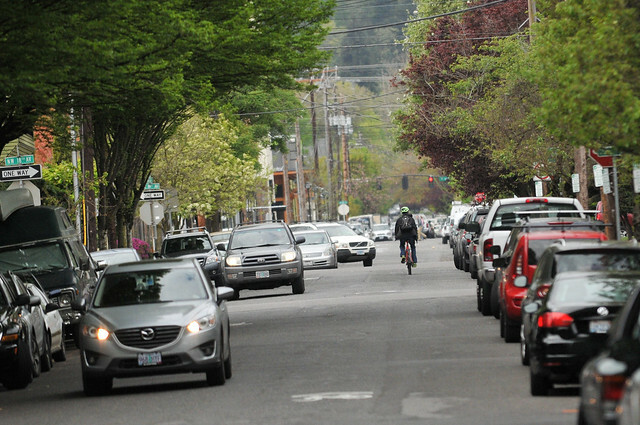 According to PBOT’s report, all of the northwest Portland greenways have over 1,000 cars per day and more than two-thirds of them have over 1,500 cars per day. Greenways in every other quadrant have much lower auto volumes. 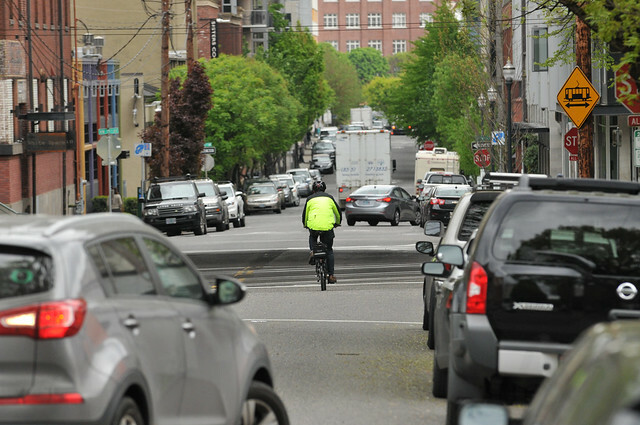 A lack of traffic diverters on northwest’s bike streets is likely to blame for the auto overuse. The only piece of traffic calming infrastructure in northwest’s entire neighborhood greenway network is at 10th and Marshall where PBOT installed a median and contraflow bike lane in 2012. Thankfully things are changing. In the past year PBOT has made big strides in their neighborhood greenway program. 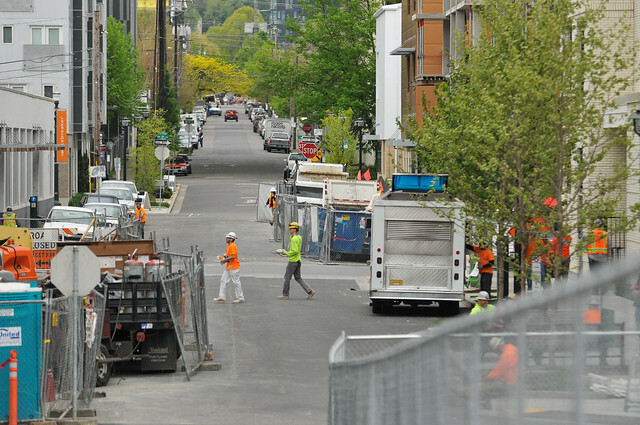 After activists clamored for more diversion on inner SE Clinton Street PBOT responded with the assessment report and followed that up with significant infrastructure upgrades. The same future might be coming for northwest, but it won’t come easily. The always busy crossing of NW Johnson at 14th. 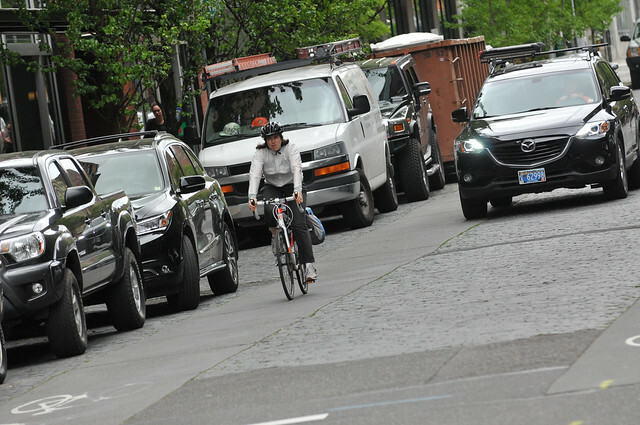 While northwest’s bike streets have huge biking upside, they also pose unique challenges. NW Overton, the street many of our readers say is their preferred east-west route, is as an emergency response route. This means it’s unlikely PBOT will be able to add calming features like speed bumps or diverters. Because of that limitation, there’s momentum among neighborhood advocates and PBOT staff to move the greenway designation from Overton to Pettygrove. View looking west on Pettygrove at 11th. Note this nice sidewalk and stormwater feature on Pettygrove. Another issue in northwest is the lack of north-south bikeways. Of the six greenways on the city map today just one of them — NW 24th — runs north-south. Farhoodi, the neighborhood activist, says NW 9th should become a neighborhood greenway to provide a “backbone” for the existing east-west streets. 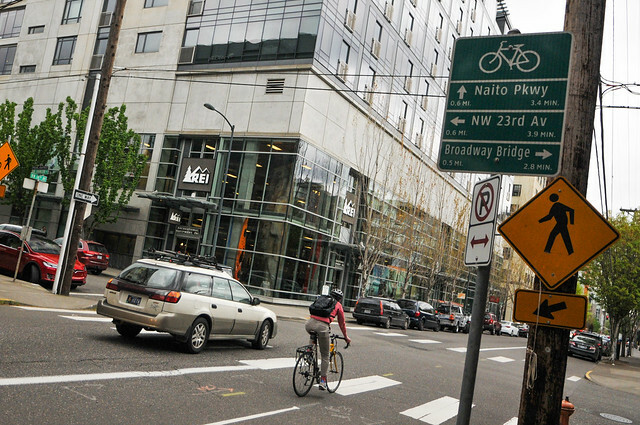 “You could connect Naito, Overton, Marshall, Lovejoy, Johnson, and Hoyt.” He’d like to see a two-way path or cycle track on the east side of 9th. It remains to be seen whether a plan like Farhoodi’s or even more modest changes likely to come from PBOT would be embraced or opposed by northwest neighborhoods. 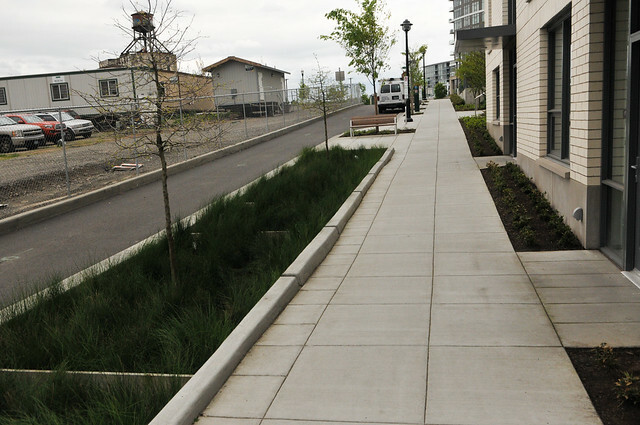 PBOT relies heavily on neighborhood support and endorsements to implement greenway projects. And unlike in other parts of town, greenways in northwest will go through both residential and commercial areas — which could make consensus even harder. The big news is that the wheels of change for northwest’s greenways are rolling. In their assessment report PBOT included “NW Greenways” as part of six neighborhood greenways that are “in need of operational improvements” to meet their guidelines. 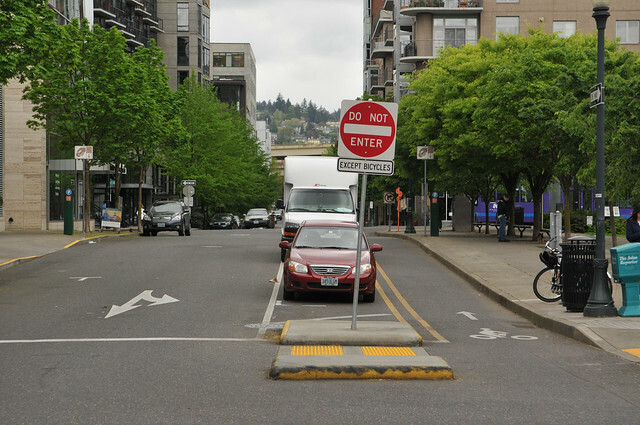 If new plans make your eyes glaze over (I don’t blame you), consider this: PBOT has recently hired a new staffer specifically to deliver small capital improvement projects like the speed bumps, median islands, and diverters that make greenways tick. Her name is Sheila Parrot and she’s already working with neighborhoods in southeast Portland to upgrade SE Ankeny. Our work is supported by subscribers. Please become one today. .
For me personally car traffic is light enough on all the NW greenways (and most other streets) that I feel pretty comfortable, but the main problem I encounter as both a cyclist and pedestrian (who lives in NW) is what seems like incredibly low compliance of stop signs in the neighborhood, and that most drivers seem to be so fixated on looking for parking spaces that they don’t even bother to see the people around them. There have been experiments in the Netherlands that removed all traffic signs and street markings for neighborhood streets, including fairly busy ones. It tended to make all users doubly cautious. Do you think something like that would work in Uptown/NW? Interesting idea for sure. I don’t think it would necessarily make things worse in the neighborhood, but it’s hard for me to imagine it would make things any better. I feel like drivers here (in most of the US in general) just aren’t used to looking out for pedestrians or cyclists. I haven’t been to the Netherlands yet but I went to Copenhagen last year and it was like a whole different world. Drivers seemed aware and respectful of cyclists and pedestrians, everyone seemed to be following all the traffic laws. I’d never seen anything like it! 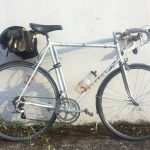 While I have read several times about the, “low number of bicycles and overall ridership in the area” during this coverage of NW Portland, as well as several probable reasons and ideas as to why that it is, I have yet to see mention of what I believe is the most likely reason. I believe that the glaringly obvious reason for the “low number of bicycles and overall ridership in the area” is the simple fact of how walkable most of NW Portland is! Having had numerous friends who have lived in NW, they all invariably got around, predominantly, by walking. They’d walk in their neighborhood, they’d walk to work (typically in downtown, ie. 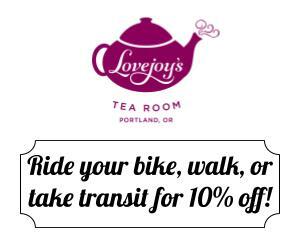 SW Portland), they’d walk to shop and to eath, and they reserved both their bike and their car for getting to the either the east side or out of the city. The area also has excellent transit and not very much pass-through traffic, except cars on 405 and (slow) tourists on 23rd. Compared to inner SE & NE, there are not many cyclists passing through from elsewhere to get elsewhere, except to Forest Park or US30. From a biking perspective, NW is kinda isolated, its own unique environment. Don’t forget all the two-way stops that make it very difficult to cross streets or turn left. All intersections in NW should be made into four-way stops. And daylight all the intersections by banning parking at the corners. All the west side (and inner east side to 12th or so) should have the corner parking by stop signs removed and replaced with a bicycle corral, provides bicycle parking for every block on every side of the street, better lines of sight for drivers and pedestrians, and keeps the bicycle racks from taking up sidewalk space. Should be the same for mid-block crosswalks as well. There’s actually a state law that prohibits parking within 20 feet of a crosswalk. The law doesn’t specify that it be a marked crosswalk, so that’s pretty much every intersection in town. It’s criminal that the city touts Vision Zero and won’t even enforce this law which would make the streets safer for all modes. Yes, and the only reason this law is not enforced is because PBOT wants the extra parking. 9th is key to the whole thing. That’s what collects most of the bikey streets (Overton, Marshall) and connects them to Front/Naito, Broadway Bridge, and at least *towards* downtown itself. 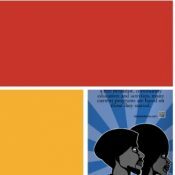 Marshall, Overton, Pettygrove? Meh, make a decision and do something to make it better. Which street they use doesn’t really matter. It’s shocking that the “low hanging fruit” that greenways are supposed to be are this far behind. It’s also shocking that the EXTREMELY undemocratic process known as “community feedback”, but really should be called “platform for whiners” continues to have any legitimacy at all in this progressive city. And by shocking, I mean not surprising at all. FYI – yesterday the Planning and Sustainability Commission recommended a City Bikeway designation for NW 22nd as part of the TSP update. 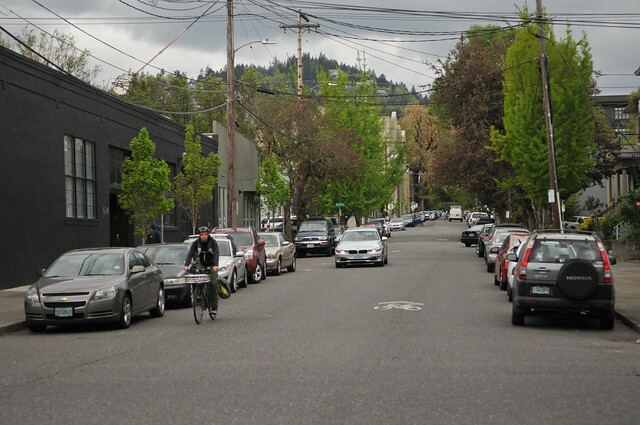 Chris, how might the PSC feel about making NW23rd car-free, as advocated by many on this site? I can’t recall any specific discussion of car-free streets during our Comp Plan or TSP discussions, but I would suggest that a number of Comp Plan policies would be supportive of some car-free streets, especially the pedestrian policies. 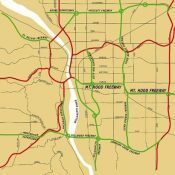 NW 22nd would be the PERFECT north south greenway. It’s a residential street running one block parallel to both 21st & 23rd. It’s a shame it currently has about a billion vehicles on it. A couple of diverters and boom!! There’s yr greenway! Part of the difficulty might be that the hospital’s main entrance is on 22nd. 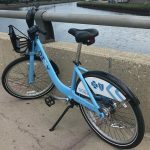 If you want to see NW Greenways improved then vote for the gas tax. The NW / SW 20th Greenway is one of the projects the gas tax would help fund. Absolutely vote for the gas tax, and it’s a shame that it isn’t 2X larger. Last I checked, it was 2016 already. The less you expect, the less disappointed you’ll be when PBOT fails, again, to live up to basic expectations. 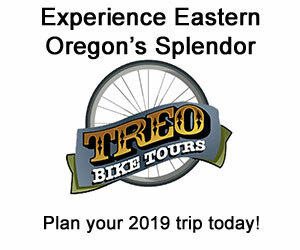 The new public trails policy that Portland adopted could make a cyclecross-themed experience in NW Portland if the city got moving with the policy they adopted over four months ago. 2. Amend Map 06-01 to allow garage access from NW Pettygrove. Presently the Con-way Master Plan prevents garage access from the NW Pettygrove Green Street. It would be great to retain this restriction. Especially since this block along Pettygrove is supposed to hold a large pedestrian plaza with a new city park adjacent, also fronting on Pettygrove. Allowing garage access from NW Pettygrove Green Street (low traffic, ped-bike friendly, linking several parks together) next to a park and plaza really seems like an unwise decision that runs counter to this street’s intended purpose. The deadline for comments is May 2nd. Nice to see it’s a proposed amendment, not a plan set in stone that we need to comment against. [Author of Next Portland here] regardless of any opinions about this project, it’s really frustrating that the Bureau of Development Services don’t publish drawings online until a week before the hearing. By the time the drawings are published the Staff Report and Recommendation to the Design Commission is already written, which really minimizes the opportunity for public involvement. To view the drawings in advance of that it is necessary to make an appointment, and go to 1900 SW 4th Ave during office hours. There is a huge and obvious equity issue there that should make the city ashamed. You know the picture of the sidewalk with stormwater feature on pettygrove? I wish thrses curbs were taller all over town, I have seen more than one sight impaired citizen fall into them! Side paths are bike paths. If the city doesn’t put in dedicated lanes, I just roll up to the safest place.